Recently, my husband, Larry, and I went on Fair Trade Judaica’s 2013 Guatemala Tour. We had a most rewarding and wonderful time. I am a weaver, dyer, and knitter. 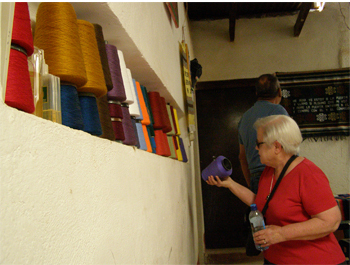 I was amazed at the beautiful vibrant colors in the fiber work. Since Guatemalan women wear handwoven clothing all the time, you see wonderful color everywhere. Many of the Guatemalan color combinations are ones I would never use but I have always heard that all colors work together – it is just a matter of proportion. Guatemalan weavers have this art of proportion down perfectly. The huipils (women’s tops that vary by village), skirts, and wraps, etc. are exquisite. The Guatemalan weavers are also masters at the art of weaving. Using fairly simple looms (either backstrap or 4 harness) they weave amazing fabrics. We saw wonderful ikats and intricate inlaid designs. We visited with several weavers and an ikat dyer who shared his whole process with us. It was like getting a class in ikat dyeing. Basically, the process is: The warp threads are wrapped from a beginning stake to an ending stake (as much as a city block away). In between, these two stakes are many other stakes that help support the warp threads. The tension along these warp threads has to be perfectly even or the end pattern will not work. After the warp is wound between the stakes and the tension is adjusted, the wrapping begins. The skilled ikat dyer knows where to bind off sections of the warp to produce a given pattern. He tightly binds off these sections with additional yarn. Depending on the desired pattern, he may have bound off 100’s of sections. The warp is then removed from the stakes and the whole warp is put in a dye bath. The areas that were bound off remain white while the rest of the warp absorbs color. The warp is then washed and dried and all the wrappings are removed. Then, the loom is dressed (a lengthy process in itself) and the weaving begins. Most often a sold colored weft is used but sometimes the weft yarn is also ikat dyed much in the same way that the warp was dyed. The resulting textiles are wonderful!! The inlaid patterns are done on a plain weave base. Supplementary weft threads are woven on the top to create designs that range from simple to the most intricate. The supplementary weft can be thought of as the paint used in a picture. Meeting the weavers was a most rewarding experience. They showed such pride in their work. One of the highlights of the trip was when Ilana met the woman who wove her tallis. Both women were so moved. We also saw lovely woven and embroidered challah and matzo covers. And speaking of weaving, one could not have had a more perfect guide than Deborah Chandler. Many US weavers were introduced to weaving by her book ‘Learning to Weave ’ (with Debbie Redding). Her knowledge of Guatemala and Guatemalan fiber arts was accompanied by her wonderful sense of humor. In fact, we had 3 guides for just 14 of us. In addition to Deborah, we had Jeannie Belanda and Bellisario Gonzalez, a local guide. No question went unanswered. We also visited two groups of women who crocheted Kippot –the most amazing Kippot. Of course, they were very colorful and very well done. In both groups, we met all of the artists. They were so proud of their work and their new designs. Needless to say, my whole family now have kippot from Guatemala. Moreover, we are anxiously waiting to see the soon-to-be-popular Venn-Bodin kippah (based on the Venn diagram) that my husband, Larry, designed. Larry and I would highly recommend this trip to anyone who has the opportunity to take it. We feel most fortunate that we were part of the experience.